For many of us, social media sites such as Facebook, Twitter, and Tumblr are a part of our everyday routine. We use it to keep track of family and friends, publishers and co-workers along with submission calls and freelance opportunities. It’s made our lives easier, as we can visit one or two places and have much of what we need at our fingertips. But even though it’s a relatively nice place, social media has its darker side. How many of you have heard of this situation or had it happen to you? You’ve had your Facebook page for quite a while and although you have a professional page you don’t have as many followers on there. So when you promote your work you simply post it first on your main page and then on your professional page when you get around to it. One afternoon you open up your Facebook to check how your friends are doing and find that your account is locked. All because you unfriended someone and they took exception to your decision and decided to retaliate. You joined in a conversation on Twitter. At first, things seemed okay but as the conversation wound on, it became heated and you found yourself facing a wall of opposition. Soon after you start receiving one star reviews on your books and death threats in your inbox. You receive a message from one of the many friends you have on a certain media site. The message has a link. You click it thinking it’s a funny video of something. Instead it’s some news site. Later, you start receiving messages from close friends telling you your computer has been hacked. In the past few weeks I’ve heard of actions similar to these used against authors and publishers and I’ve heard of and seen many more over the past few years. While these things were infrequent in the past, the weaponizing of social media has become much more common. For some of us, our first experiences with social media were pleasant. MySpace and the very first versions of Facebook were new and exciting places. It was fun to chat with people miles away, exchanging experiences and building online communities. On occasion there were some creepy people, but they were far and few between and easily avoidable. Internet safety wasn’t a big thing as there was this assumption that most people were nice and harmless. Over the years that has changed. Hacking, spoofing, doxxing, and bullying are tools used by others to either gain access to accounts and data or disrupt businesses and personal lives. Over the past few years, threats online have become more common--especially against women, POC, and minorities. However, anyone can be a target. While there’s lots of discussions as to why, we won’t go into that here. Instead we will touch on types of attacks,how to keep you and your accounts safer and what to do if it happens to you. Note, I did not say safe. Very little is safe when using the internet. First, let’s look at some different types of social media weapons before we discuss how to protect yourself against them. I’m sure you’ve seen other authors or artists warn people that a second account has shown up that doesn’t belong to them. This is called spoofing and it’s more of an annoyance than an actual attack. What happens is someone copies photos and information from your actual homepage and then creates a new account. Friend requests are sent from this new account. Unsuspecting people accept the request and are then usually bombarded with ads for sunglasses or are propositioned for personal information. Most of the time this is a sneaky ploy to gain access to the people you know; however, it could be a concealed plan for more active attacks. How many of you have seen a strange post on a friend’s wall or received a random link in a message. Hopefully you’ve not responded or clicked on those posts because more than likely that account has been hacked. Hacking is a process where someone else gains control of another’s account. This can be done through various methods but the most common is a keylogger script that records what keys you touch when you log into an account or freely given because of an email scam. Your computer can be infected by visiting webpages that are infected with various viruses or those sneaky emails that look like something official from a website you frequently visit. Hacking can cause you serious trouble. If you tend to use only a few passwords for all of your accounts, you could be open to more serious damage even if you don’t see it right away. It can even load various botware and viruses into your computer. Some of which may be activated much later. I know it’s fun to find out what your Halloween Monster name might be, but you might want to think twice about posting that information online. While some of those memes are harmless many are venues for information gathering. While using the letters of your first and last name might not amount to much, pair that with the street you grew up on, your first pet and what kind of car you drive (all security questions for other websites) you might open the door for hacking or worse. Tie up that information with a keylogger, your personal information could be compromised. This is perhaps one of the most devastating attacks that can be launched on social media. Cyberbullying is the use of pressure, fear and manipulation against another individual online. It can start out small with one person but can then expand to include groups. It can also lead to other kinds of attacks such as doxxing (broadcasting personal information) and DOS (Denial of Service) attacks against websites and companies as well as threats of physical harm. Mostly, cyberbullying occurs when someone displays an opinion or worldview that does not agree with another group. Attacks begin with just a few people, but because information spreads quickly, a cyberbullying attack could include thousands in just a few hours. Many people who have come under attack have had to shut websites and social media accounts down. A few have even lost jobs, had to move or requested police protection. Cyberbullying can even push people to commit suicide. Kind of scary isn’t it? If you didn’t already know, sites such as Twitter, Facebook, and Reddit aren’t all unicorns and butterflies. Social media attacks happen every day, but there are ways to protect yourself from the worst of it. For many people this is the go to option. It’s safe--for the most part--and easy to do. Posting and responding to vanilla discussions means you aren’t putting yourself at risk and making a target out of yourself. A very limited social media presence can keep you safe from a lot of the attacks seen above. But it also limits your contact to family and friends. Setting up a Google Alert for your name, user names and company can help you track down conversations that mention you or your product. When a spoofed account on social media pops up, you could be immediately notified of a problem. Also, when your name comes up in conversations you might get a head’s up before a firestorm hits. Many people do not use passwords that are secure enough to deter a hacker. Plus most people tend to use the same password for several sites or variations of the same password. It’s a potentially troubling scenario. If a hacker gets a hold of your info, you could spend a lot of time and money putting things right. There are programs that manage your accounts and passwords. While this might seem like a bad idea (having all of your passwords in one place) these management systems are pretty secure. They can automatically change your passwords on any device they are connected to plus with a random generator, you aren’t relying on similar phrases which could get hacked. Social media is full of interesting things, articles and links to other sites. However, it’s also a hacker’s playground. Before you click on that link with the baity headline, look to see where it originated from. Could it be sent from a questionable site? Is this something that person would normally post? Also, be wary of friend requests. The temptation to friend everyone and build your numbers is very strong, but you really don’t need to be friends with everyone. When you get a new friend request, check out the profile. See what they have up on their wall. If the account was activated yesterday or two years ago and it has only a few posts, there’s a good chance that account is a spoof or someone who’s going to be asking you for money or personal questions later. Two things that can help protect you against hackers are your firewall and virus scan. Your firewall should always be on. It helps stop unwanted signals from reaching your computer. Your virus scan should be setup to automatically update and scan your computer at least once a week. Blocking, finding and destroying programs such as keyloggers and viruses help keep your information safe. Also backing up your data is really important. More than one person has had their account shut down because of these rules. It’s impossible to verify who flagged the account but usually there had been a disagreement with someone in the near past. Unfortunately, even if you make yourself as safe as possible, you could still be a victim. A spoof account in your name pops up, someone hacks into your account, you are the target for cyberbullying. What do you do then? Spoof accounts can pop up at any time. All anyone has to do is copy photos and information from your account or website.If you are notified that a spoof account has been spotted, report it immediately. Different social media sites have different steps so be sure to do a bit of research on that first. Usually the account will be closed quickly. Even if you are careful, your account could still be hacked. Many times someone doesn’t realize they’ve been hacked until a friend or family member notifies them. Changing your password blocks the hacker from doing more harm but be sure it’s full of random letters, numbers and special characters. Write it down or use a password manager. Don’t use the same password for different sites. Run an update and scan your entire computer. If you experience cyberbullying, first screenshot all conversations. Many times those words on the screen will disappear or change. Secure the information on a flash drive or external hard drive. This way you can take it to the police if you have to make a report. If possible have someone else also screenshot the bullying. Reports can be made to the social media platform, although it’s questionable as to what can be done. If the accounts that are harassing you dummy accounts they can be shut down. Share what’s going on. The more people who know what’s going on the better. First of all you gain support from friends and family. Second of all, those people can become a buffer if they are so inclined. If the bullying gets to the point where personal information is shared online and threats are made, the police should be notified. While these types of threats aren’t always deemed serious, new laws and procedures are on the way. Sometimes you will need to back away from what is going on and let someone else handle it or even close your accounts for a short time. And other times, you might need to seek out legal help. Everyone has probably experienced some sort of cyber attack on social media at some point or another. Mild ones can be frustrating but do little actual harm. However, always be aware that things can escalate. Caution is always your best option even when posting to friends and family. "This is a clear, informative, and insightful guide. I enjoyed the conversational tone and was reassured by its professionalism. 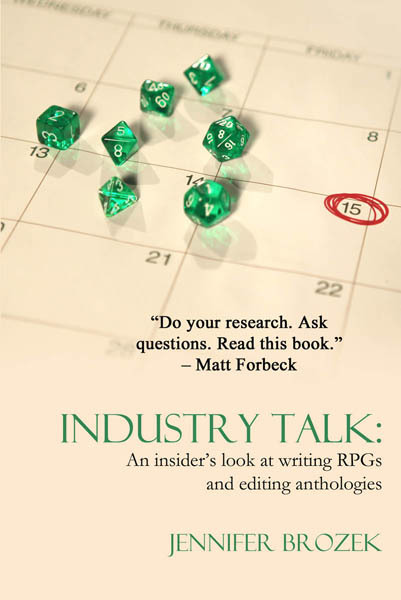 Jennifer Brozek has a broad range of experience in a number of facets in the industry and she's packed a lot of wisdom into this collection of essays. It isn't going to tell you every little thing, but it does provide excellent points of focus." 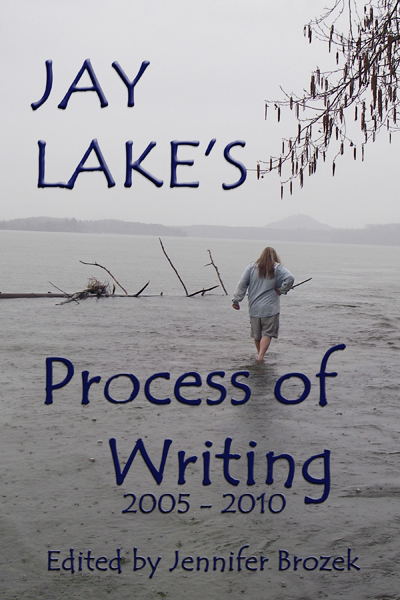 "There are so many fascinating details & process gems in Jay's writing book. I've seen a lot of this stuff in his blog over the years (it’s mostly composed of blog posts), but reading it all in one place is mind-blowing. It's an unconventional writing book, but definitely worthwhile to study the evolution of Jay's writing process and his various other ruminations on the subject. Write more!"